We head to Congleton via my parents house, to collect my Dad who does like a 7am start. We take him to all the glitzy places and today’s its Congleton’s turn. Now I’ve had a bad knee all week, well longer actually, so I’m not at all sure how this is going to pan out. I intend to start slow and not build up to a faster pace. 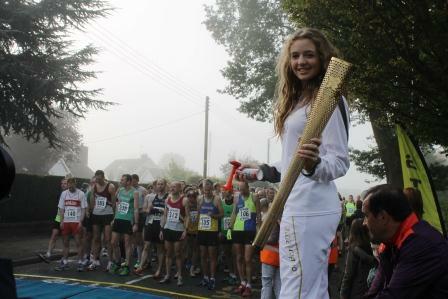 As is now the norm, someone with an Olympic torch helps start the race. Then as we leave the start at the High School, we find the first few miles to be a bit hectic, very busy and we all end up crammed on a pavement next to a busy main road. It was a bit like the ark, two by two, as the field hadn't had chance to thin out by then. Although I suppose this did it. There was the grass verge but I didn’t want to get my trainers muddy and I think everyone else thought the same, so congested it stayed. Then across a busy roundabout heading into a supermarket before we finally quit the built up area. Thereafter it’s mainly country lanes, villages and plenty of room to run or hobble. Where I’m sure the view would have been really pleasant, if it wasn’t for some high hedges and a covering of low lying mist that didn’t lift. Actually perfect conditions for running, just not for sightseeing and despite a few undulations it seemed a fairly fast course. Not that dissimilar to Ipswich the other week, in fact that was probably hillier. The race is chip timed and well marshalled. The drinks were in cups but for once I didn’t mind easing down to walk to drink from them, to give the knee a rest. All the drinks stations also advertised sponges, but they proved elusive, I never saw one. There was an extra drinks stop, set up outside the Black Swan and I eased up, just in case... but it was only soft drinks. The race is called the 'Sting In The Tail' which is because, on the map at least, there was a huge dip, or may crevasse is a better word, at 12 miles, that you would think you’d need full climbing gear to get out of. Ahh, the wonders of map scales. The dip was not that severe. I didn't have to crawl. L is racing too, she’s chosen the Quarter Marathon option, which I think is a first. At only £6 it’s bargain. Although she doesn’t get the t-shirt, which was a bit dull anyway, to be honest. Instead she gets a teddy bear and a much better goodie bag than me. There’s not much in mine at all. I queue up for a massage but it’s not looking like a proper leg breaking sports massage, just two women playing patter cake on peoples’ legs. Which is always welcome but not worth queuing half an hour for, so I go to join L and my father in the cafe. We head back to my parent’s place and collect my Mum before heading to the Canal Warehouse in Shardlow, where it turns out they serve a poor Sunday lunch but some excellent Hobgoblin. After a bit of late afternoon R&R we decide to check out a beer festival that is happening at one of our local pubs, the Admiral Rodney. It’s nothing to get too excited about but they do have Otter Ale and that takes us back to many happy days spent in Devon. The pub are offering a discount for us Camra members and a loyalty card scheme, which is rather poor as you’re only allowed one stamp per day, rather than one per pint as is the norm with these things and it’s only valid for the fortnight of the festival as well. So not much of an incentive to revisit. Back home, the knee is throbbing again and I rip open a sachet of jointeeze or something, which was one of the things in my goodie bag. L and the dogs immediately start choking from the aroma of the stuff and Doggo even momentarily gets off the bed. It’s all in a good cause guys, my dodgy knee, as is the Savlon for other areas that have taken a bit of chaffing.